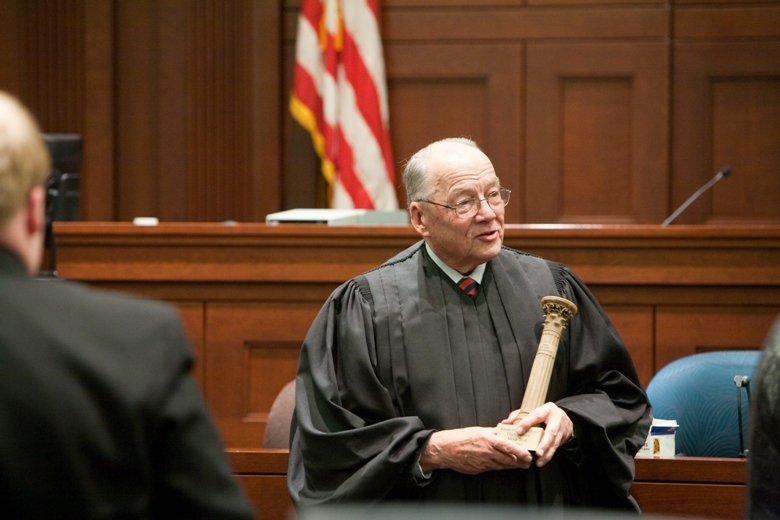 Happy Birthday United States District Judge Lyle Strom « Hercules and the umpire. In our beautiful courthouse in Omaha, we celebrated Judge Lyle Strom’s 90th birthday yesterday. Judge Strom continues to try civil and criminal cases. One of his goals is to try a jury case when reaches the century mark. Lyle is beloved and respected by all. He was one of the most highly regarded civil trial lawyers in Nebraska before becoming a district judge as he neared his 60th birthday. He mentored Chief Judge Bill Riley of the Eighth Circuit when the two were law partners. He served as President of the Nebraska Bar Association at the same time as he was Chief Judge of our court. To my way of thinking, Lyle remains one of the best trial judges in the nation. 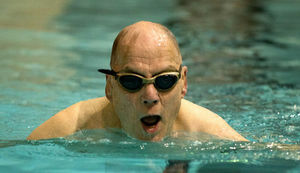 At 5:00 AM, five days a week, you will find Lyle in the pool. I resent guys who are 90, but look and act 50. Lyle has always called them as saw them. Despite the fact that Strom was a conservative Republican when nominated, speaking the truth meant taking on the “crack” cocaine laws with a vengeance. In a 1993 case, Judge Strom ruled that crack cocaine penalties disproportionately affect African-American defendants, holding that blacks are “being treated unfairly in receiving substantially longer sentences than caucasian males who traditionally deal in powder cocaine, and this disparity simply is not justified by the evidence.” He used this disparity to depart downward and impose 20 year sentences on two black defendants, instead of the 30 years otherwise required by the Guidelines. By the way, if you ever need advice on single malt scotch, Lyle is the man to see. A judge who sees what is fair rather than seeing race is the kind of judge we need more of. The rest of the joint finally caught up to his prescience on sentencing disparity. I’m thankful to have tried two jury cases in Judge Strom’s court – one in Omaha and one in North Platte. He is among the top five judges whom I’ve had the privilege and pleasure to appear before. A true gentleman and jurist of the highest caliber! I was in the midst of a difficult criminal defense case in Omaha with excellent US Attorneys from the D.C. civil rights division. Things were going very poorly for me with a witness. I was headed downhill fast. So I asked to approach the bench. Once there, Judge Strom asked me, “Vince, what do you need?’ I said “Just a break, Judge Strom smiled and said “Vince, been there myself. Take your time, get settled.” After a couple of minutes, I sat down, resumed cross-examination and it went much better. The jury returned a split verdict. Later Judge Strom granted a Judgment of Acquittal on the remaining counts which the Circuit upheld. Judge Strom makes you and your client welcome in a special place. I have always left his Courtroom win or lose, happy about my choice to go to law school. I agree with Dredd, great post Judge. As I was graduating out of my clerkship, the law clerks were having donuts in Judge Strom’s office as we always did on Fridays. Judge Strom knew I was going and pulled me aside, and gave me a little farewell talk. He knew the law firm I was going to, and he told me a story about one of the founding partners, Dan Gross. Gross was a legendary Omaha trial attorney in the 30’s and 40’s. Judge Strom told me a story about having a trial as a young attorney with Gross, and being absolutely petrified. But just prior to Gross beginning his voir dire, Strom saw Gross’s hand shake behind the podium, which no one else could see. The man that should be arrogant was still nervous before starting a trial. He told me from that moment on he vowed to never forget that. It was a lesson in respect and humility, and he told me that I would be a better trial attorney if I remembered that. I remain grateful for that lesson. Have known Lyle my whole life or more correctly he has known me my whole life. He has always been a perfect model of what a lawyer should be and a total gentleman. Happy Birthday to one of the very best. Always a pleasure to appear in Judge Strom’s court. This blog–whether you intended it or not– is a way to discover some of the leading lights of the Bench and Bar and, by coming to know about them, allows us to take their example for ourselves. Judge Strom is another in a long line of people that I have “met” through coming here and I am very appreciative for having done so. You are very kind. The reverse is true for me. I have met wonderful people and learned so much from them through this new medium, and you, my friend, are among them. All the best. There are few men that I admire like Judge Strom. I have coached high school students for 12 years in the Nebraska High School Mock Trial program, which now rightly bears Lyle’s name. He has been active in the Boy Scouts since some time I can’t remember. The high school students who have appeared in front of him in the state finals all love him. Lyle will hate the comparison from an age standpoint, but he reminds me so much of my paternal grandfather that it gets a little scary sometimes. My paternal grandfather was forced out of the University of Missouri by the Great Depression and went to work for Armor Meatpacking in the stockyards at age 19. At age 59 he retired as an Executive Vice President when they offered him the Presidency. He said he thought he was too “old” to take the job. He lived a long time after that. They were (are) both so loaded with common sense and an ability to size up people in a few minutes that it was (is) sort of scary. So it was very nice to be with him close to his birthday (which is actually January 6th). And it was nice to see the author of this blog (a man whom I also admire greatly) and his lovely wife (who is surely headed straight for heaven, who will be waiting while the author of this blog and I spend some time in Purgatory — yeah, I know it’s not your faith tradition) looking so well. Oh, and I meant that the wife of the author of the blog will be waiting with my wife, surely swapping stories that we’d rather not hear. Thanks for this personal perspective on Lyle. You are correct to concentrate on Lyle’s love of young people. Lyle has devoted so much time to Mock Trial and the Scouts that in these parts he could be considered the father of both of them. This on top of raising (with his dear departed wife) a whole bunch of his own children who have gone on to achieve many wonderful things like the Presidency of a University, or a doctoral degree in the biological sciences, or service as a very high ranking military officer in the JAG corps. Your kind comments about my wife are also appreciated. That she once thought seriously about becoming a nun (who probably would have carried a ruler to smack students on the knuckles) is not surprising to people who know her. It also should suggest that she has devoted her varied talents to my spiritual growth. In her view of things, skeptics can be taught to see the light by the faithful’s acts and deeds rather than words. Yes, indeed, you are kind man. That’s sort of disturbing actually. Law school Deans like you and law professors like you have a reputation to uphold, and true kindness is not often associated with such folks. You break the mold. Watch out! The Guild may get you. Judge, I will be glad of the company in Purgatory. St Catherine of Genoa believed that Purgatory was more a place of education than of suffering. If she is right as a quick learner you will be quickly gone. As a thick headed Irishman I will have a long waite. Borchers will probably wind up as dean. Happy birthday to Judge Strom. Reading of his accomplishments and dedication to the legal system made my day! Rich, I’m selectively kind. I’m conscious of the advantages I had and have an eternal soft spot for people who overcome disadvantages. Teaching Civil Procedure (a subject that if you taught it right (wrong) you could literally leave the students not knowing what it was about — I remember shoes and railroads but not much else) I have developed sympathy for students who grasp the material at different rates. But I have no patience for people who throw away their opportunities. I offer my students a deal. I call on students at random, but if life intervenes — you were sick, you had a sick kid, etc. — you have to give me a note before class saying that you’re not prepared and explaining why, and then I won’t call on you. But if you don’t write me a note and aren’t prepared, or (more commonly) have only a passing familiarity with the assigned material, I give you no quarter. I often use federal judges as an example. I say that I know all of them in Nebraska, and I believe that I’m on good terms with all of them. But if I were trying a case (Stickman and I have tried to work out the timing of trying a case together over a summer) do you think that if I were in my case in chief and didn’t have a witness ready to go that the judge would give me a soothing pat on the head and say “that’s OK, we’ll just waste the afternoon of these people who are on the jury for an afternoon”? Now if something that was really beyond my control happened — the witness was unexpectedly hospitalized or escaped custody or whatever — and I brought that to the attention of the court, we could surely work out something, whether it’s calling witnesses out of order or giving the jury the afternoon off. I suppose it’s one of the advantages of having practiced some (and still being connected to practice now as a consultant etc.) for the subjects I teach. I hate teaching discovery, because it makes no sense to the students at that stage. Last year I got a friend of mine who had just tried a big civil case to give me the DVD’s of a couple of depositions that she had taken, both of which were used at trial — one planned, the other unexpectedly. So we spent a whole class just watching the depositions, with me occasionally stopping them to explain why I thought the lawyer was doing what s/he was doing. Anyway, I had students of mine the next year tell me that it was one of the most meaningful experiences of their first year, they got to see what lawyers actually do. But I’ve gone on too long. It was so nice to meet your wife in person and see you feeling better. Pat.